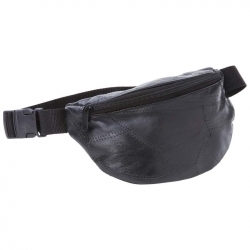 You see belt bags everywhere these days - at the mall, movie theaters, entertainment parks, on joggers. Our Maxam(R) Italian Mosaic(TM) Genuine Lambskin Leather Belt Bag features 5 different zippered areas, including 2 located on the strap area to hide "emergency money". Carry your wallet, cellular phone, sunglasses, credit cards, maps, and other items as close to you as you can get without wearing them next to your skin. Strap will adjust to a maximum of 48'. Measures 16' x 6' x 4-1/2'. 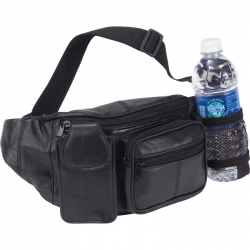 Features 2 zippered compartments, 43' adjustable nylon strap, and padded back. Measures 10' x 5-1/4' x 1'. 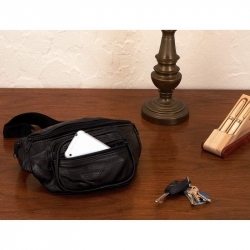 The Embassy(TM) Solid Genuine Leather Gun Holder Belt Bag keeps your firearm and personal contents secure and accessible. 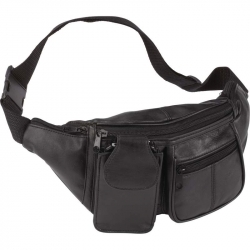 Featuring a self-repairing zipper and an inclusive adjustable holster. 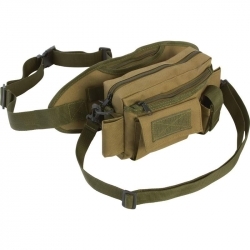 7-1/4' x 4-1/2'' main compartment with 1-1/2'' gusset and nylon adjustable waist strap. 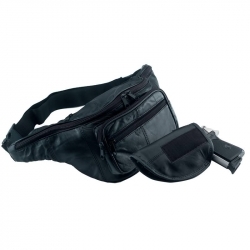 The Embassy(TM) belt bag quickly unzips to access your pistol. Features black stitched webbing zipper pulls, heavy-duty buckle, 3 exterior zippered pockets, and padded back. Measures 13-1/2' x 6-1/2' x 2-3/8'. Features zippered main compartment, cellphone holder, 4 zippered exterior compartments, and mesh pocket for water bottle. Measures 14-1/4' x 5-3/4' x 4-1/2'. 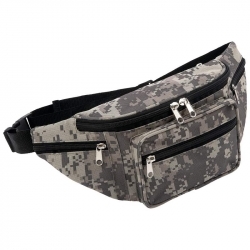 When you need hands-free storage, the Extreme Pak(TM) Invisible(R) Pattern Camouflage Water-Resistant Waist Bag conveniently carries your belongings, up-close and secure. The waist strap will adjust up to a maximum of 48". Features 5 zippered pockets for optimum storage. Measures 14-3/4' x 5-3/4' x 3-3/4'. 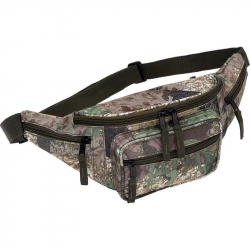 The Extreme Pak(TM) Invisible(R) Camo Water-Resistant Waist Bag fastens securely to the waist with a 38 inch adjustable strap. Store valuables in 5 separate compartments featuring black zipper pulls and buckles. 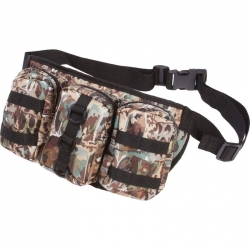 Water resistant, heavy-duty 600 Denier exterior in a tree camouflage design. Measures 15" x 6" x3-1/2"
Features zippered main compartment and 6 exterior pockets, including cellphone holder. Measures 12-1/4'x 2-3/4'x 3-3/8'. 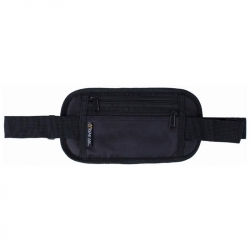 The perfect travel waist bag. Features 1 zippered main compartment and 40' adjustable strap. Measures 9' x 5-1/2' x 2-1/2'. 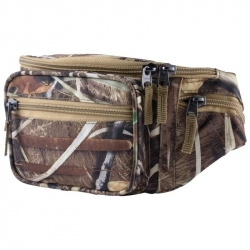 Features heavy-duty 600d construction; 3 zippered compartments; 2 compartments with hook and loop fasteners; adjustable shoulder strap; and 27' adjustable waist strap. Measures 9' x 5-3/4' x 3'. 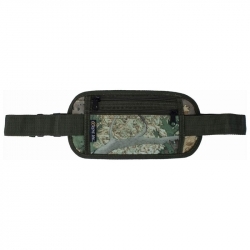 Carry what you need, hands free, with the heavy duty Extreme Pak(TM) Digital Camo Water-Repellent Waist Bag. 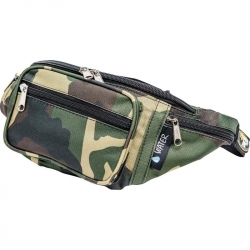 This water resistant waist bag offers hands-free, portable storage that will hold up under a variety of conditions. The five zippered pockets provide convenient compartmentalization to store gear in an efficient and organized manner. Strap will adjust to a maximum of 48'. Measures 14-3/4' x 5-3/4' x 3-3/4'. 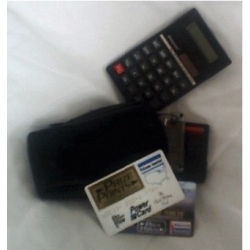 This sleek carrying case will hold a calculator, plastic cards, change, or just about anything you want to carry.